Recognition of reservoir quality is an important objective in reservoir characterization process. By definition, the quality of a reservoir is described by its hydrocarbon storage capacity and deliverability. The storage capacity is a function of porosity, whereas deliverability is a function of permeability. Thus, both porosity and permeability are the main reservoir quality controlling factors. 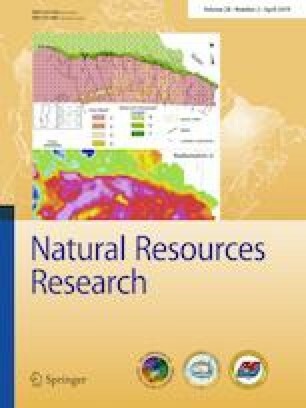 Five wells were selected to study the reservoir quality of the Nubia sandstone in the Gulf of Suez, Egypt. The Nubia interval, deposited in continental to shallow marine conditions, consists mainly of sandstone intercalated by thin layers of shale. Three wells were partially cored and the other two wells are completely uncored. Based on several complementary techniques, it is concluded that the Nubia sandstone is of moderate to extremely heterogeneous quality. The porosity–permeability cross-plot showed fair-to-medium relationship, indicating the significant role of diagenetic agents. The Nubia reservoir quality has been enhanced principally by fracturing, dissolution and leaching. However, the reservoir quality decreased by cementation, compaction and filling of pore spaces by kaolinite. Based on principal component and cluster analyses, six electrofacies are recognized within the Nubia interval. Three electrofacies are dominant, whereas the other three are subsidiary. Flow zone indicator (FZI) was determined based on mean hydraulic radius and normalized porosity. Correlation between electrofacies and FZI permits discriminating the subject formation into reservoir quality ranks. The relative complexity of this reference formation notwithstanding, because of the robustness of the resulting electrofacies–FZI correlations, it was relatively straightforward to recognize and reasonably predict the reservoir quality of the uncored intervals. The authors would like to thank the anonymous reviewers for their significant comments that helped us improve and reconstruct the manuscript. Special thanks are also due to the Editor Prof. Dr. John Carranza, whose patience and insightful suggestions have led to a concise revised version. The authors are grateful to the Egyptian General Petroleum Corporation and the Gulf of Suez Petroleum Company for releasing the data. Pittman, E. D. (2001). Estimating pore throat size in sandstones from routine core-analysis data: Search and Discovery Article 40009. http://www.searchanddiscovery.net/documents/pittman/index.htm.